Mitt Romney told reporters aboard his plane on Tuesday afternoon that he had prepared an 1,118-word "victory speech" to give supporters on election night. 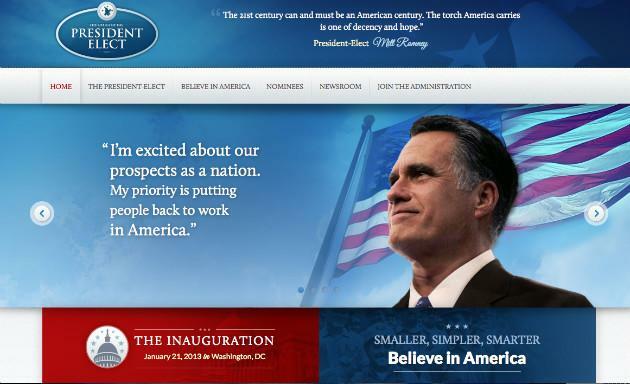 And it appears the Romney campaign was preparing a website for his transition from candidate to president, too. The site appeared online on Wednesday and was taken down—but not before Taegan Goddard, a blogger for Roll Call's Political Wire, captured screenshots, which included a "President Elect" seal, information about the inauguration, a fresh tagline ("Smaller, Simpler, Smarter") and a quote from the Republican nominee ("I'm excited about our prospects as a nation. My priority is putting people back to work in America."). President-elect Romney is working closely with his transition team to put together his administration to ensure a smooth transfer of power on January 20th, 2013 and get to work for the American people. It's unclear how long the transition site was live or who was responsible for its content. A spokesman for the Romney campaign did not return a request for comment. According to the Huffington Post, it was produced for the Romney campaign by a Provo, Utah-based web-hosting company whose owner said the site was slapped together about 10 days before the election. But it's not unusual for the campaign to have had one ready. As CBSNews.com noted, federal funds are provided to both presidential nominees months in advance "to build transition teams and rent office space." Perhaps the Romney IT team was simply still in shock. A few minutes after the former Massachusetts governor gave his concession speech early Wednesday, President Barack Obama's victory speech was streamed live at the top of MittRomney.com, adjacent to the words "Stand With Mitt."